The winding is tapped at various points. Since the taps are provided at various points in the winding single tap must be connected at a time otherwise it will lead to short circuit. Hence the selector switch is operated after disconnecting the load.To prevent unauthorized operation of an off load tap changer, mechanical lock is provided. To prevent inadvertent operation, electromechanical latching devices are provided to operate the circuit breakers and de-energize the transformer as soon as the tap changer handle is moved. On load tap changers are used to change the turns ratio without disconnecting the load from it. Tap changing can be done even when the transformer is delivering load. On load tap changers considerable increases the efficiency of the system. 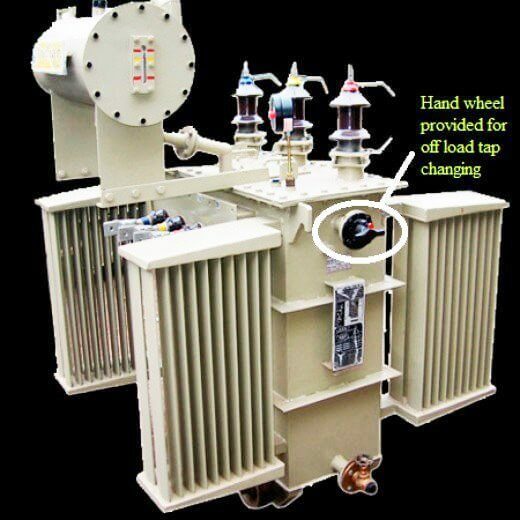 Nowadays almost all the large power transformers are provided with on load tap changers.The reason for providing On load tap changer in power transformers are1. During the operation of on load tap changers the main circuit remains unaffected.2. Dangerous sparking is prevented.The taps on the windings are brought to a separate oil filled compartment in which the on load tap changer switch is housed. The tap changer is a form of mechanical selector switch which is operated by a motor by local or remote control. A handle fitted for manual operation in case of emergency.The selector switch is a form of make before break switch and during the transition of the tap changers from one tap to another, momentary connection must be made between the adjacent taps. This results in short circuit between the adjacent taps. The short circuit current must be limited by including resistor or reactor. Hence all forms of on load tap changer are provided with an impedance to limit short circuit current during tap changing operation. The impedance may be resistance or a center tapped reactance. In modern designs it is invariably carried out by a pair of resistors. Where should we Terminate the Cable Shields ?